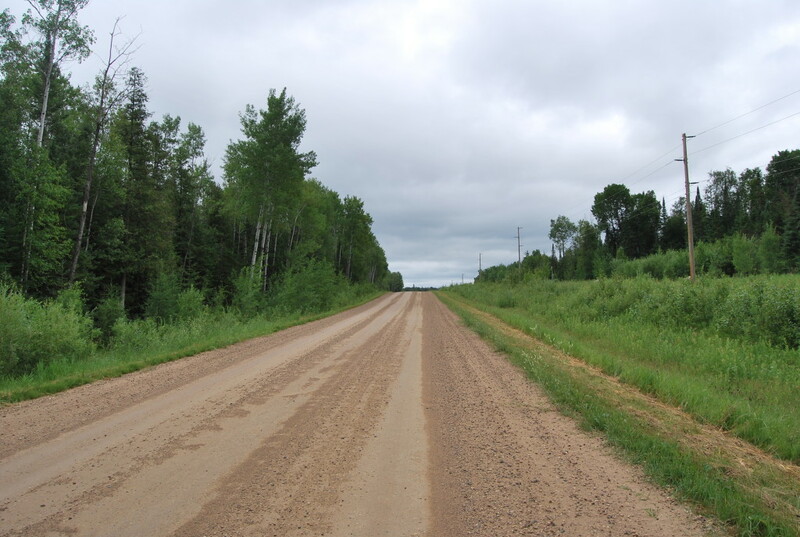 One of the most puzzling and curious pieces of land in the contiguous United States of America is a remote, 600-square mile region of Minnesota that, if you are driving a car, is only accessible by first going through Canada. (Boats and planes can cross Lake of the Woods). It’s remote, isolated, and beautiful. And it’s the only place in the Lower 48 that is north of the 49th parallel. 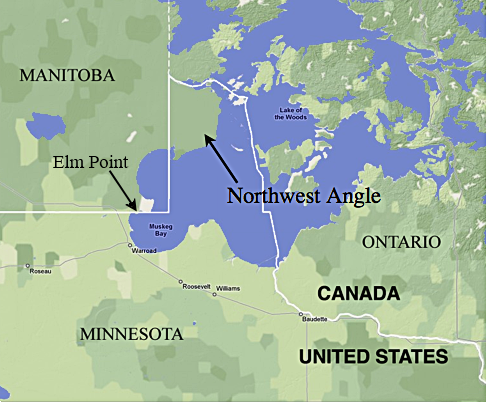 The Northwest Angle, or simply, “The Angle,” is the result of a surveying error back in the late 1700’s. The peninsula is an “exclave” that can be reached by crossing the gargantuan Lake of the Woods by boat or plane, or driven over during the winter. 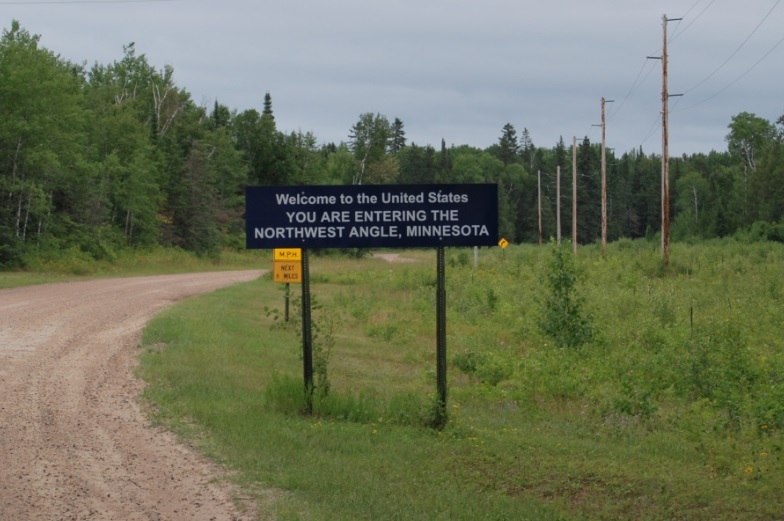 Otherwise, visitors to the Angle must go into Canada first and then back into Minnesota. A majority of the Angle is also part of the Red Lake Indian Reservation. It is the northernmost point of the United States in the lower 48. 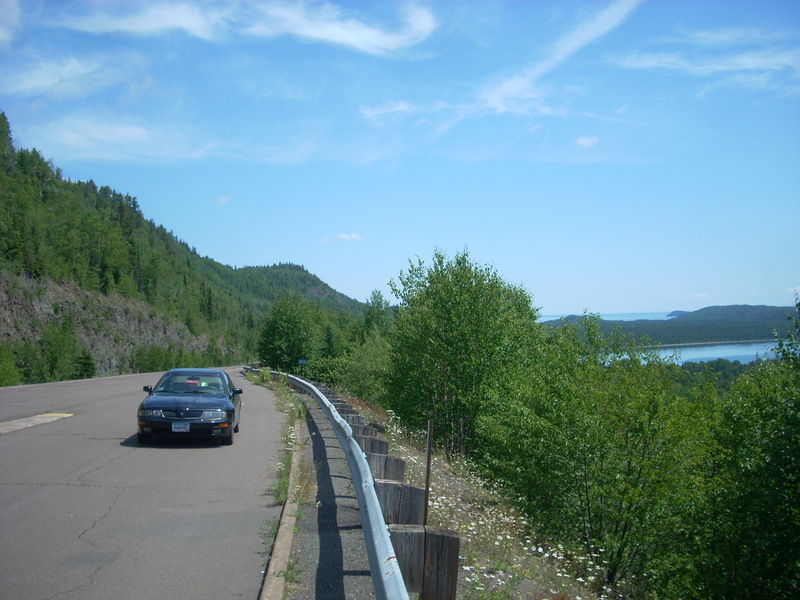 To drive to the Angle, visitors typically cross into Canada at Warroad, MN, and drive an additional 52 miles, the last 17 being a dirt road, through the Canadian wilderness that leads to the border crossing, which is an amusement itself. Actually 8 miles past the official “border,” you find a small shack not much bigger than a phone booth, and check in via videophone as there is no staff on site. There is a small box with a phone with two buttons; an American Flag and a Canadian Flag. Upon leaving, you must check back in with Customs via the same booth (seen above). The Angle is a popular tourist destination primarily for fishing enthusiasts, but equally for those in search of something quirky and off-the-beaten-path. The Angle is home several small communities, but considering how isolated the area is, it might as well be its own country. 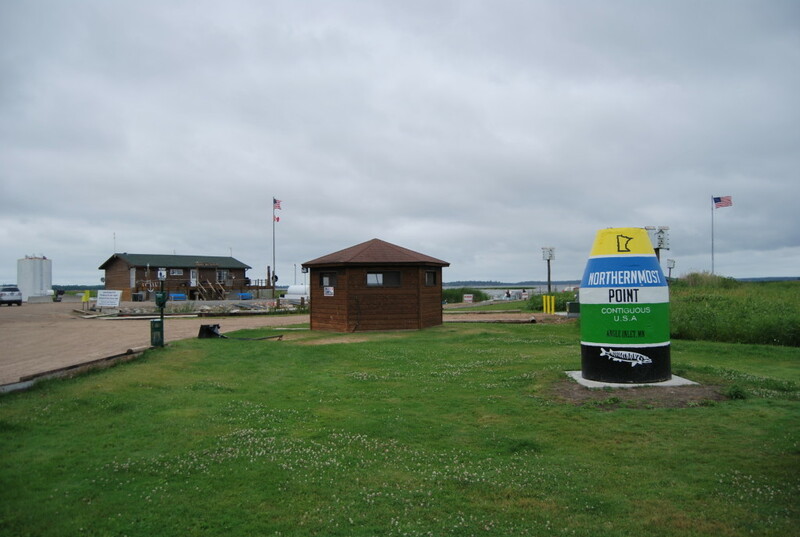 The main draw here is fishing, where there are several fishing resorts as well as public access to Lake of the Woods and its countless islands, cabins, and boat-in resorts. 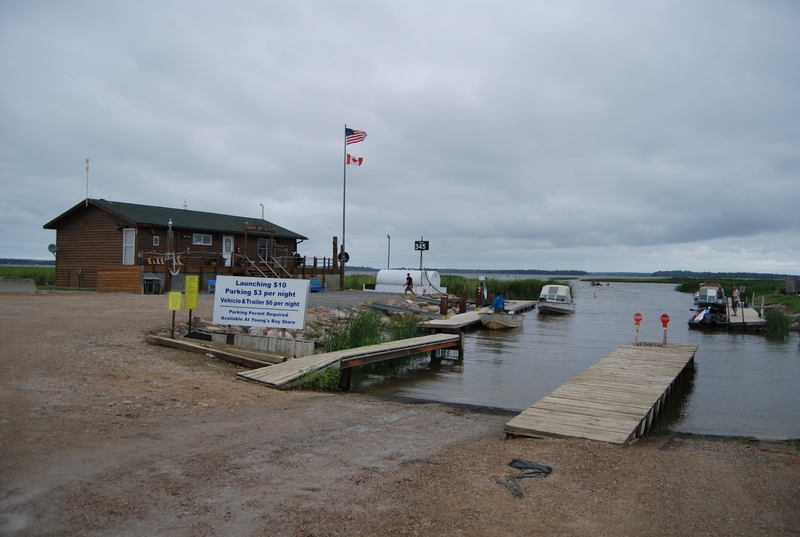 Youngs Bay features a bar-and-grill, a sizeable resort, and a public boat launch with parking area for those heading further off the grid. It also features an obelisk marking the Northernmost Point in the Contiguous United States, a nod to the one at the southernmost point in the US at Key West, FL. 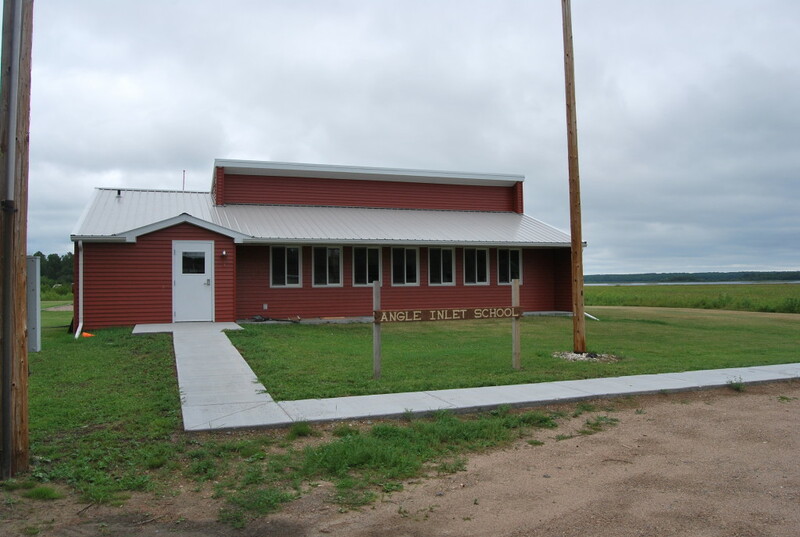 The other main area of note in the Angle is the “town” of Angle Inlet, which features a one-room schoolhouse (the last of its kind in the MN), the northernmost post office in the contiguous US, a golf course, an airport, and a general store, all of which are tiny and spread out. There is no hospital, grocery store, or really any other businesses. The population of the Angle as a whole is just over 100, with a small percentage living on islands. 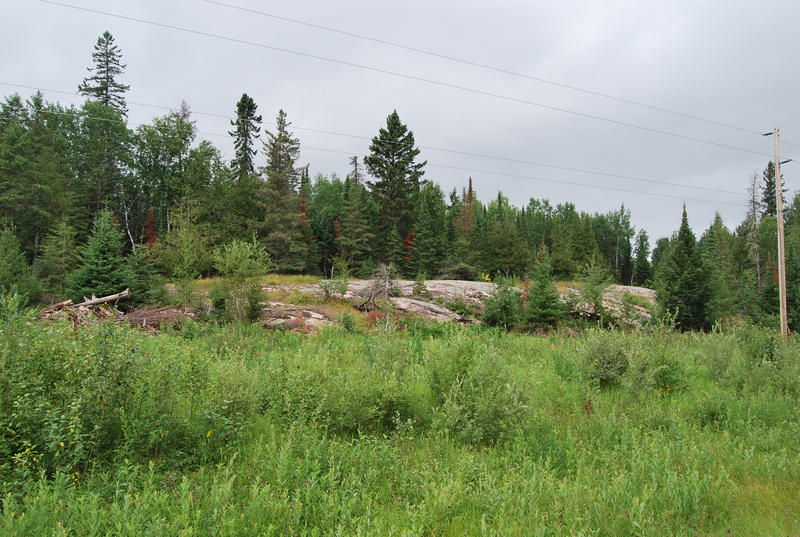 The scenery is mostly flat, wooded, and the occasional rock outcrop. 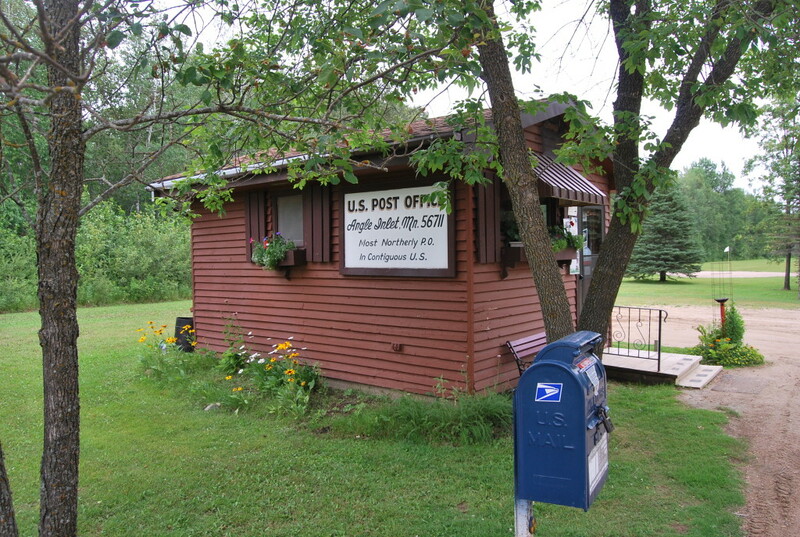 Unless you are visiting the Angle to do some fishing for trophy walleye, northern, and muskie, the obligatory stops include the tiny post office, the schoolhouse, the northernmost point obelisk, Jims Corner and many of the quirky but to-the-point signs that describe the area. The final curiosity of the Angle is the historic Fort St. Charles, a re-created trading post that was constructed in 1732 by French Voyageurs, or fur-trader/pioneers. The location of the original fort was in dispute for hundreds of years afterwards as the original fort was abandoned after a massacre which took place in the 1740’s. The fort was reconstructed around 1950, and since it is located on an island, you can only visit it via boat during warmer months. 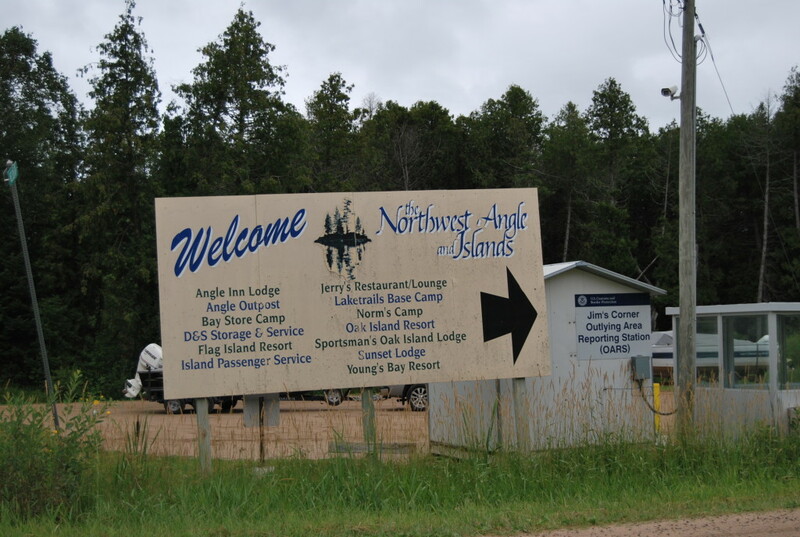 The Northwest Angle has been on my bucket list for many years and it was fun to be able to finally check it off. One thing that also stood out is how unmarked it is. 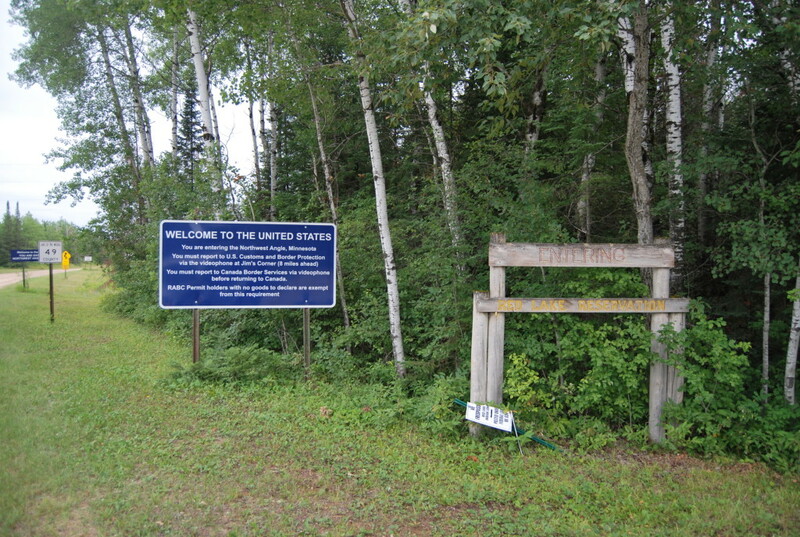 Once you cross into Canada via Warroad, there are no signs or markers whatsoever until you are almost to the Angle. 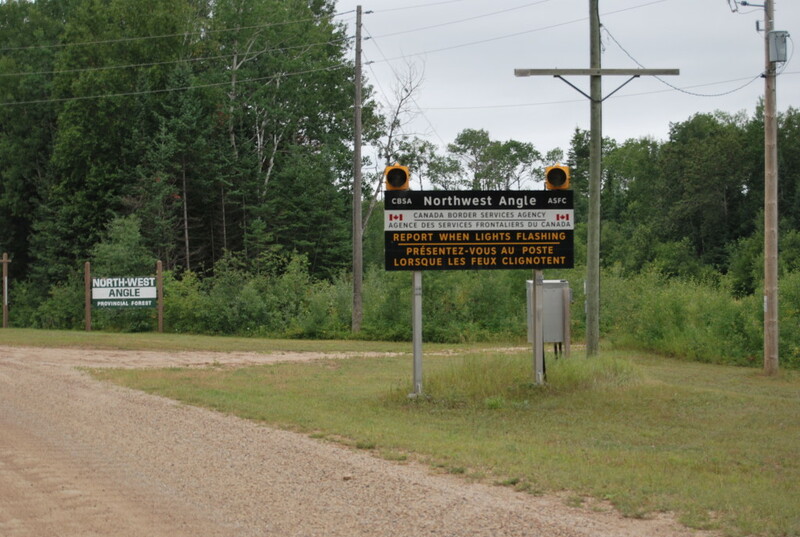 The turn off the main road past the Canadian border entry in Warroad is not marked. There are no signs telling you how far it is. You would have no idea it even exists until you are almost to the border. In fact, you cross the border and travel another 8 miles until you reach Jims Corner, which is hardly marked. Even after that, it’s still not obvious where you need to go. Bring a GPS. 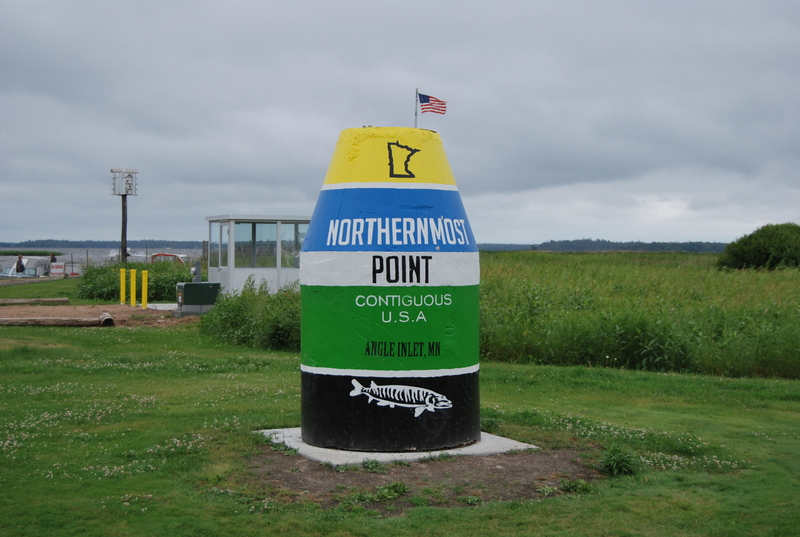 While in the area: Lake of the Woods has always been a popular fishing destination, and nearby Baudette is home to the famed Willie Walleye statue, who just was replaced with an updated fiberglass creation. Also, Warroad is home to an incredible collection of rare, vintage, and restored muscle cars called The Shed, owned by the current owner of Marvin Windows. It must be long gone then! 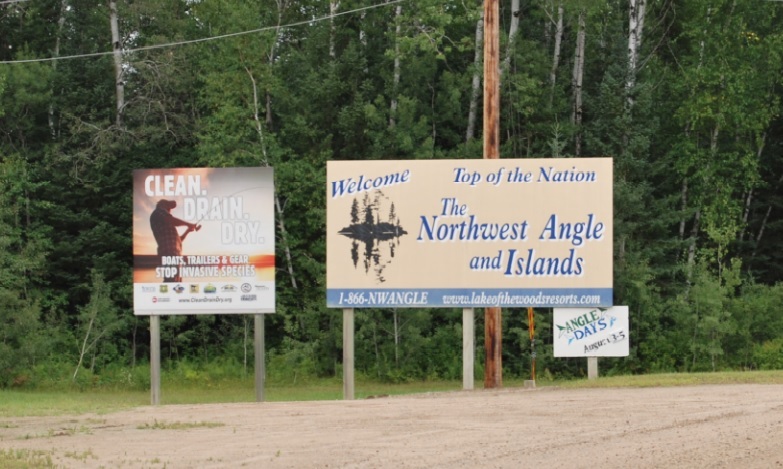 I guarantee you there is no sign like that between Warroad and the Angle. The distance sign was still there the second time I visited in 2011. Strange that it would be taken down. Also the “Northernmost Point” monument must be newer as I don’t remember seeing it. All your other pictures look exactly the same as the ones I took. Guess I’ll have to go back!